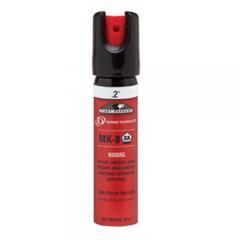 Defense Technology's First Defense MK-8 2% Stream is a reliable and defensive aerosol designed to help with crowd control, riots and extreme law enforcement situations. The compact canister is easy to grasp and holds approximately 10 short bursts of OC (oleoresin capsicum) spray. Safe to use without compromising the officer, it packs a full 2% major capsaicinoid (MC) concentration to efficiently irritate the eyes and reduce an aggressor's vision. When activated the stream can reach up to 15 feet, providing enforcement officers an advantage in subduing assailants. Policing professionals can count on Def-Tec's line of OC sprays for high impact protection during unpredictable conditions.